Every great writer has their own process! What's the blogging process look like for you? Do you set aside time each week to write or do you wait until the inspiration hits? Do you finish a post in one night or use the week to perfect it? Do you edit your blogs or just hit publish? Whatever it is you do, it’s unique to you and we want to learn about it. Usually, my posts come to me at some incredibly inopportune time - middle of the night, in the shower, while driving, in the middle of a meeting. If I force myself to sit down and write without any type of prompt or motivation, it ends up the blog equivalent of a bad stick figure drawing (if you've ever seen me draw a stick figure you understand how just bad that is). So when inspiration strikes, I write it down, anywhere and anyhow I can. I have sticky notes by my bed for ideas that come to me in the middle of the night (though admittedly those notes are sometimes illegible in the morning). I have a list of potential blog topics on Evernote. I have notepads on my desk, in my laptop bag. If I'm traveling, I often carry a mini notepad in my purse, to jot down ideas on the road. 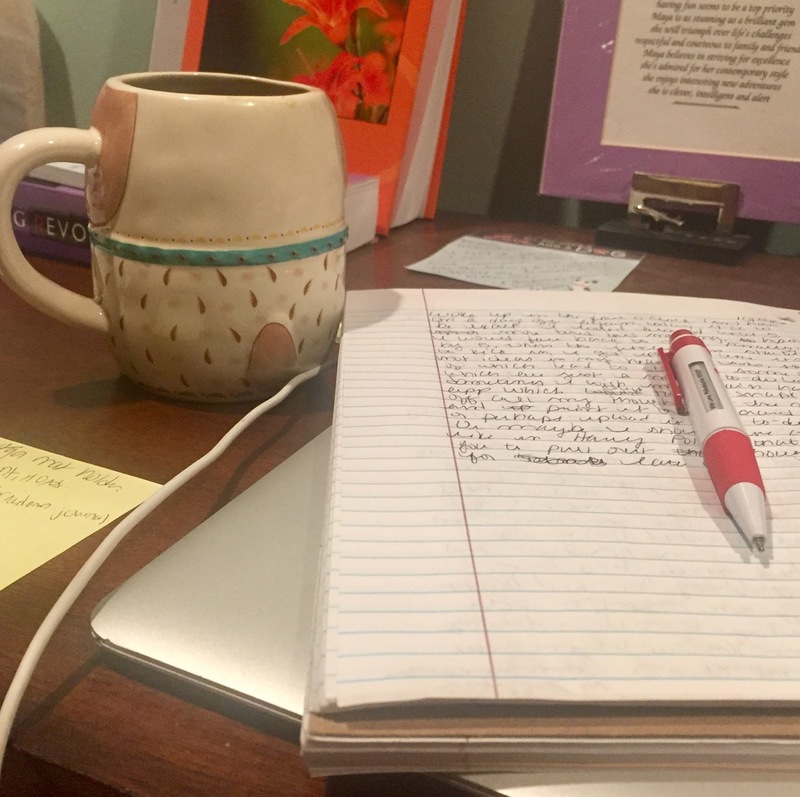 If my laptop is handy when an idea comes to me and I have only a few minutes, I'll open up my blog and jot down just a few lines to start a post, knowing I'll have to come back to it later but wanting to get the ball rolling. In cases such as HAWMC, where I have prompts, it's a bit easier. I don't have to "come up with content out of thin air", so to speak. But because my blog is so emotionally fueled and focused, and because my emotions can be so unreliable, I can't just force myself to write at a set time on a set day without fail. (Disclaimer: sometimes I write several of these challenge posts at once when I'm feeling motivated. I call that "finding creative solutions.") I do try to set aside times to write each week, but those are pretty flexible and vary from week to week. They have to be, because I might literally not be in the mood to write at the set time. On the flip side, there are times that I could write for hours, particularly during intense emotional cycles. I occasionally try to share what it's like in the middle of a hypomanic episode or bad bout of depression, because I feel it's the closest way for people to actually understand what I'm battling. They may not have experienced it themselves, but me writing when I'm in the throws of it, it's kind of the writer's equivalent to Facebook live or Periscope or whatever your preferred "live" medium may be. The nature of my cycling is such that, once I cycle out, it almost feels like it happened ages ago, and I find it significantly more difficult to describe in depth. It feels like I'm telling a story, instead of a personal account. If I write during, I'm much better able to explain in detail, in a way people can visualize, even possibly feel. That said, if I know I'm in a really, really bad state, I try to give it a day or so before I post. I don't want to raise any cause for alarm, if none is actually needed. Proofread. I sometimes type (and talk) faster than my brain fully computes. If I don't proofread, there could be a lot of jumbled up mess in my posts. Or rather, more than there already is. Don't post ragingly angry. Post kind of angry, but not ragingly so, especially if the anger is primarily directed at one person or situation. Anger is an important part of mental health and not one a lot of people like to talk about. So I think it's important to post from that viewpoint so that, as described above, people get a "real time" insight. I also know, though, that my anger can be fueled by anxiety, panic, and hypomania, and that this multiplies it, making me significantly more upset about things than I otherwise would be. 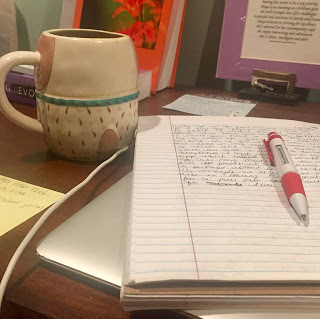 I don't want to emotionally hurt anyone by letting this take over in a blog post, so even if I write, I try to hold off and see if I still feel that way a little while later, or if I've "simmered down" a bit. I've written a lot of drafts that, if posted, would have resulted in some serious foot-in-mouth syndrome later on. And if I am angry, I never, ever mention personal names (assuming it's someone in my personal life I'm angry at). Ever. Don't overthink it. I proofread, and I make sure any facts that I've stated as facts are as accurate and updated as possible, but I try not to re-read sentences for hours, wondering if it sounds ok, if it makes perfect sense, what everyone will think of it, etc. As long as it's somewhat sensical, and it's not going to lose me friends or my job, it doesn't have to sound perfect. My brain is a beautifully, weirdly, messy place. My blog reflects that. Intentionally. I post for me, but I hope that it helps others. Writing in general, and therefore blogging, is therapeutic to me. I was always a writer. As a child, adolescent, teen, young adult, I journaled. I still do (on pen and paper, in addition to my blog). So sometimes, I write just to "get things out". Sometimes, I end up not posting those pieces. Just writing it has done it's job, and I realize I don't want to, for whatever reason, post those. But when I feel that others may go through the same thing, that it could help them or inspire them in some way or simply let them know that they're not alone, I post. So I write for me, but I do so in hopes that it will also help others. These are by no means a "recipe" for writing a mental health or chronic illness or any blog. In fact, I pretty much spent the last x number of paragraphs saying, "I really don't have a process, I just throw spaghetti at the wall and see if it sticks." But I guess that's kind of the point. I have my ways that work for me, but they're fluid. And you may have a great process that works for you. But if you don't, that's ok too. If you want to write, write. There's no perfect formula. That's the beauty of a personal blog - it's as unique as of each us, our conditions, and our journeys. My stickies in the middle of the night and mentally writing blogs in the shower is what works for me - and I'm completely ok with that. And when you find what works for you, run with it, even if it's equally as weird a process.